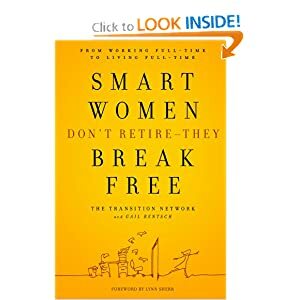 Smart Women Don’t Retire – They Break Free: From Working Full-Time to Living Full-Time; The Transition Network and Gail Rentsch (June 2008). A review by Heather D. Barron, Esq. I reviewed Smart Women Don’t Retire – They Break Free: From Working Full-Time to Living Full-Time. I specifically wanted to know how retirement differs for women as opposed to men; however, I learned not only about women and retirement, but also about how women approach transitions in all stages of life. I feel that every woman, young or old, will find this book a useful tool at any stage of their life, and it will open their eyes to the importance of planning early for retirement. Every attorney should have this book on their shelf as a ready reference for themselves and to share with their women clients. Smart Women Don’t Retire was produced by The Transition Network (TTN) in conjunction with author Gail Rentsch (a founding member of TTN). TTN is a nationally recognized organization founded in 2000 for women over fifty who are thinking about the next stage of their lives. It is comprised of small peer groups that meet regularly to provide support for women as they investigate ideas about the kind of changes they are seeking in their lives. While many TTN members are seeking volunteer opportunities where they can continue to use their special skills, others just want to make new friends and have fun, but most of all the women want to change society’s image of women over fifty. The book states that it is designed for women fifty years of age and older to help them orient themselves on their retirement journey. I found that although a woman in her later years will find this book indispensable, it is also applicable to women of all ages in varying stages of their life. The book asserts that the women of today’s pre-boomer and boomer generations find themselves in a peculiar situation with regard to what retirement is, what it means, how to transition into their new roles, and what obstacles or joys they will face as women in transition. The women who are currently coming into retirement age now are very different than previous generations. They will be trailblazers for the next generation of women who will become eligible for retirement in the next twenty or thirty years. As background, throughout history, women rarely entered the workforce and remained in the home dependent on the men in their family for financial support. If they did enter the workforce, it was often due to dire need and was for low pay. In the 1950s, some women began to have jobs outside the home as long as it did not conflict with their traditional roles as wives and mothers. Retirement consisted primarily of leisurely activities with family members and lady friends. It wasn’t until the women’s movement of the 1960’s that women began to consider having full- time jobs outside of the home for financial compensation separate from their husband’s support. The current population of women pre-boomers and boomers are well-educated, have increased life expectancy, and are healthy through exercise and nutrition. They lived through the women’s movement of the 1960s and saw for themselves the revision of a woman’s place in the world. These women have embraced work and become accomplished, intelligent, independent women who imagined the previously unimaginable. These women broke barriers in the workplace, achieved high positions in their chosen careers, earned money, power and independence, and many of these women look to their careers to define who they are in the world. Therefore, this is the first generation of women to really go through their own retirement. There is no “retirement” blueprint for them to follow. One of the problems I found with the book is that the book jacket itself leads the reader to assume that the book was written for an elite group of business and government leaders who probably don’t need the help that this book is supposed to provide. In reality, the book addresses women from all walks of life, all financial levels, and all ages. Although many women interviewed in the book claimed that they want to work well into their seventies, it is believed that in the next decade, the largest population of women in the work force will retire in some form. This book provides, in a very organized manner, an outline of the issues these women will face. Issues such as thinking about retirement, deciding how to enjoy their retirement, changing careers in later life, ageism (both in the workplace and society at large), volunteerism, friendship, finances, legal documents, how retirement will affect their significant other (if married or in a committed relationship), and loss of a loved one. The book is divided into chapters, each covering a different aspect of retirement and life transition. Following a short general overview of the topic, specific topics are discussed and actual experiences of TTN women are used as examples of what women should and should not do to bring about their desired goals. The book provides exercises in self-analysis on each of the topics with suggestions about how to manage the issues, insight from top psychologists, commentary from other women who have already faced these issues, and provides real alternatives to traditional retirement theories. This book also is filled with pages of internet resources for women regarding careers, life planning, health, networking, travel, and volunteering. The book discusses all facets of retirement, but I personally believe the most important section is chapter 3: “Can I Afford to Make a Change? “ It deals with handling personal finances competently and managing retirement portfolios effectively. Among the topics discussed is the idea that traditionally women have not assumed responsibility for their own financial security. Rather than a lack of ability, many authorities in the field believe that women have been “socialized” to avoid talking about money and thus have given control of their finances to others. In addition to an extensive list of “things to do” to take control of your finances, there are detailed descriptions of real-life experiences of women who have developed workable financial plans for their retirement. As a woman and a lawyer, I found Smart Women Don’t Retire – They Break Free: From Working Full-Time to Living Full-Time insightful into the differences between women’s and men’s feelings about retirement. I encourage every attorney to read this book as it provides a great deal of understanding into the needs of their women clients. I believe that this book can be a valuable tool for women fifty and over who are contemplating their retirement in the near future; however, to save this book only for women who meet both of these requirements would be doing a great disservice to all women who are in transition (a constant condition of life). Recent high-school and college graduates, new mothers, divorced women, new business owners, and newly retired women could all benefit from reading some or all of the topics in the book. Because of the easy-to-read format and the short lists of “things to do” under each topic, women can gain knowledge about or do additional research on topics that may have a great affect on their lives for many years to come. The book stresses to all women that it is never too early to begin preparing for financial security, and never too late to make new friends and help others.